Microsoft PowerPoint for Windows XP - a tool for creating multimedia presentations. The program allows integration of audio, video content, includes a graphical editor with a set of basic tools, supports simple drag and drop of objects, display of hyperlinks, animation of transitions and various visual effects. The application has a simple interface with support for shortcuts, includes a full-screen view mode and side-navigation menu for slides. The editor contains a library of ready-made templates, has various options for exporting presentations, supports collaboration and the SharePoint service. 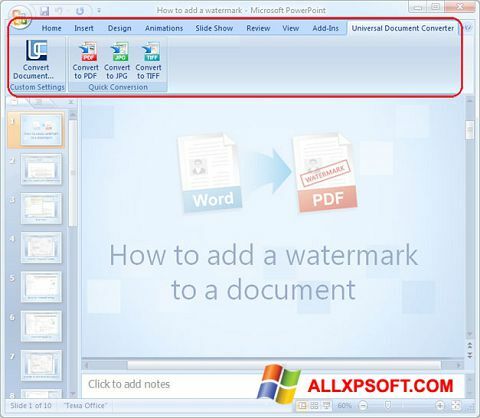 You can free download Microsoft PowerPoint official latest version for Windows XP in English.